Updated and revised, this new edition of Caplan’s Stroke continues to provide a concise and pragmatic approach to the evaluation, diagnosis, and management of adult and pediatric stroke patients. Dr. Caplan—a highly esteemed stroke authority— shares with you his vast experience and wisdom as a stroke clinician, including his time-tested strategies and unique clinical pearls that you can implement into your own practice. Expanded coverage of imaging and laboratory diagnosis and treatment as well as extensive revisions throughout, brings you the latest advances on prevention, complications, and rehabilitation. The use of case studies illustrates the types of clinical scenarios you may experience in practice. 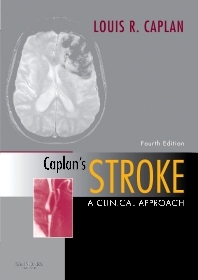 And, its conversational, easy-to-read format make Caplan’s Stroke an ideal resource for general neurologists, non-neurologists, and stroke specialists alike. Discusses all cerebrovascular diseases to help you differentiate among all types of stroke so you can treat each patient appropriately. Takes a distinctly personal and individual approach to general principles, pathophysiology, diagnosis, treatment, and rehabilitation, offering practical, clinical guidance on stroke and stroke related issues. Provides detailed discussions on stroke syndromes in children and adults, including large artery occlusive disease of the anterior circulation, brain embolism, spinal cord stroke, and many, many more, to help you better manage every condition you see. Uses case studies to highlight and emphasize clinical points.